With a year gone by, I suspect a repeat post (essentially) would be most useful for readers & shareholders alike. But I’ll obviously (briefly) cover developments in the past year & incorporate the latest results. I’ll also introduce some tweaks in terms of valuation & perspective, as you’ll see, but I still plan to rely on a similar Sum-of-the-Parts analysis – so I definitely recommend you first re-visit my previous DCP post. i) Four of its five ‘divisions’ are currently operating well below their potential. Speciality dairy’s (obviously) loss-making. Current operating margins for both the seed potato business & Monaghan Middlebrook Mushrooms (MMM) are at a substantial discount to prior and/or future margins. Much of Donegal’s property portfolio produces little/no rental income, plus it lacks the leverage required to produce decent returns (current debt’s comfortably supported by its other operating businesses). Only the animal feed business is operating at full potential. ii) Management identifies three divisions as core/strategic. But again, speciality dairy is loss-making, plus it can’t hope to earn the margins that would be possible as part of a much larger food/dairy company. And DCP’s a minority investor in MMM – in the end, it doesn’t control the business, or management’s strategy. I’d argue Donegal ultimately has just one core/strategic business: Seed Potato. Identifying the growth potential of its core business, recognizing the (underlying) intrinsic value to be ultimately realized from its non-core assets/businesses, and exploring the value enhancement opportunity(s) to be exploited with these disposal proceeds…all this paints a picture of a very different company & a dramatically higher share price. – Free cash flow was 3.5 M. But buried in this, we see a significant 5.6 M reduction in payables (to just 17.0 M). This is an astonishing & voluntary allocation of cash – revenue increased, cost of sales increased, financial stability improved, I’m sure trade creditors would have been perfectly comfortable with an increase in Donegal’s payables. – Net proceeds from loan repayments & business/property disposals amounted to 3.9 M. However, another 3.7 M of property disposals was announced subsequent to year-end, mostly long-awaited proceeds from the sale of 245 acres of An Grianan in 2013. Of course, these individual components also differ from my forecast, so you may find this reconciliation a little specious. But my real point here is a different one – while cash generation’s obviously crucial to Donegal’s investment thesis, the pace of disposals & the allocation of proceeds is equally crucial. Obviously, no seller wants to leave money on the table (or miss out on higher prices next year), but there may be very limited opportunity to re-deploy proceeds into a more compelling & value-enhancing investment – a greater sense of urgency is clearly the highest value priority here. Obviously, I mean share repurchases – last year, I demonstrated the compelling value they offer for shareholders…but to date, management’s chosen to re-allocate cash into a 6 M pay-down in debt, plus the reduction in payables I mentioned already. [Only 60 K was spent on share repurchases since my last post!]. This exercise in liability management’s admirable (my 16.2 M end-year 5 debt prediction’s bested in one fell swoop), but totally unnecessary – I mean, how hard is it to service a 545 K interest bill?! And it’s certainly not value-enhancing. With every month that goes by, management risks missing the window of value for large-scale & opportunistic share repurchases. The price rally in the past year’s an unfortunate reminder of that, though I guess my post & your sustained buying are really at fault here…shame on us! Speciality Dairy: Management still refuses to break out the figures, hiding them in their Food-Agri segment. Revenue was EUR 8.3 million in 2011 – assuming a mid-2012 growth rate of 23%, FY-2012 revenue should have been EUR 10.3 M. However, both Organics for Us & UHT mini-pot products were sold/discontinued – excluding them, 2012 continuing ops. revenue would appear to have been just 8.5 M. And 2013 growth of 30% for the Rumblers & Biogreen/Good Heavens brands would put revenue at 11.0 M today. Allowing for a 0.7 M net property profit & an estimated 1.8 M profit for animal feed (see below), a (1.4) M segment loss is implied – which clearly detracts from Donegal’s overall P&L and valuation. But these brands/business are valuable to a larger dairy/food business, which could quickly realize a 10-20% operating margin (deserving at least an implied 1.33 Price/Sales valuation) running them through their own manufacturing & distribution network. Assuming an acquirer’s willing to share some upside, a 0.33 Price/Sales price tag could be about right now – Donegal now owns 80% of the business, so that’s worth 2.9 M.
Stevedoring: God knows where this is now recorded in the accounts, but presumably Donegal still owns 75% of McCorkell Holdings. Little has changed, revenue’s EUR 1.4 M, net losses are negligible, and net assets are 1.7 M (which I suspect are understated) – let’s assume 75% of Book (or 1.2 M) is actually a fair value here. Other Investments: These include 49 K of quoted shares, EUR 100 K of prize bonds, and 188 K of unquoted shares, while the value of the One 51 holding’s nearly tripled (again!) – all told, these holdings are now worth 2.7 M.
– An Grianan: Donegal recently confirmed An Grianan as a 2,830 acre farm (including a 500 acre lake). They also announced a long-awaited 245 acre sale, plus a prior 205 acre sale of what I understand was poorer/mountain land. This leaves 1,880 acres, which I now value at an average EUR 10,195 per acre – as per the latest Ganley Walters Ulster farmland report. Any downside risk to this average is, I think, offset by the potential upside we see from their N/NWest 200+ acre sales average of EUR 10,647 per acre (& this particular sale). And while a lake is a valuable asset in the US, precious little value is usually attributed to an Irish lake. But I still think it offers some value in an estate sale, for example, or perhaps some kind of conservation donation & tax deduction deal – let’s assign, somewhat arbitrarily, an eighth of the average farmland value per acre. Finally, I’ll forgo any milk quota value – it’s not clear how much remains attached to the estate, or if any value can still be extracted before quota abolition. That’s a grand total of 19.8 M.
– Ballyraine: Last year, back of the envelope, I figured these student residences were still worth their initial 2004 valuation of 3.75 M. I also referenced a long-term 7.8% residential yield. But Donegal applied an 11-12% yield in their 2012 annual report, which seems ludicrous when recent buyers seem perfectly happy with (sub) 6% Dublin commercial yields. Let’s split the difference & apply a 9.5% yield for the moment, which equates to 3.1 M.
– Agri-Stores/Oatfield/Bridgend: I’ll assume no change in their respective values of 1.4 M, 0.8 M & 0.2 M – for a 2.4 M total. The Oatfield building is being demolished despite local protests (a derelict sweet factory provides more jobs, I suppose?! ), so it should soon be up for sale/development. – Deferred Tax Liability: That’s a grand total of EUR 25.3 mio for investment property, marginally ahead of the 24.4 M balance sheet total. Against this, there’s a 3.6 M deferred tax liability – we’ll increase this to 3.7 M accordingly. Associate Loans/Investments: We’ll assume Donegal’s Northwestern Livestock Holdings investment remains worthless & MMM has now fully repaid its loan(s). That leaves a 43% stake in Leapgrange, now worth just 0.1 M.
– Animal Feed: With Donegal’s habit of chopping & changing segments, we’ve only 2 years of stand-alone financials for the animal feed business: 2010 revenue was 25.1 M & operating profit (OP) 1.0 M, while 2011 improved to 27.7 M revenue & a 1.2 M OP, for an average 4.2% OP margin. 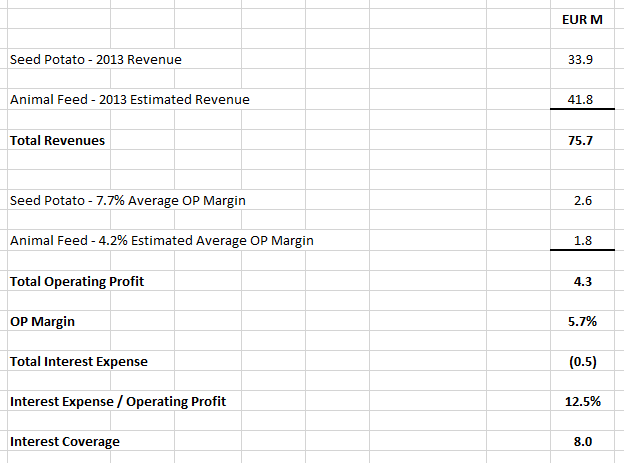 2012 was a blockbuster year & I estimate 2013 revenue was 43.8 M (based on my speciality dairy analysis above). 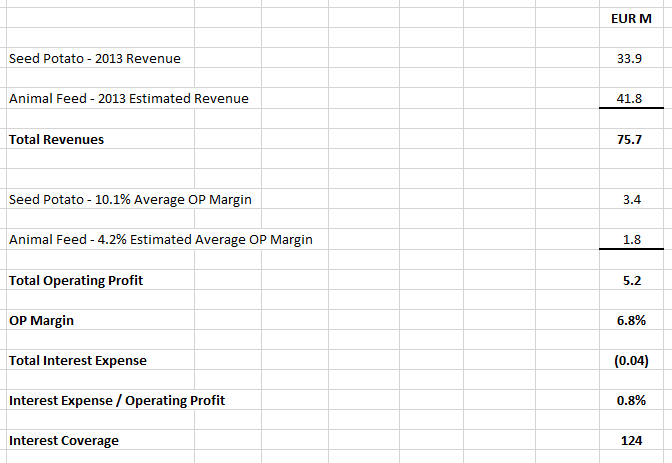 I think I can safely assume a 4.2% OP margin for 2013. – Seed Potato: While 2013 confirmed a significant improvement (OP margin of 5.3%), the seed potato business has suffered two tough years of weather disruption (plus Algerian & Syrian issues) – margins remain well shy of the 10.1% average we saw in 2009-11. You’ll note the company enjoys 8.0 times interest coverage, and interest expense/operating profit remains well within my normal 15% limit. [NB: If we substitute the latest produce margin of 5.3%, we’d still scrape by this limit]. This level of debt appears sustainable. I value a business with a 5.7% OP margin at a 0.5 Price/Sales multiple – and that’s inclusive of Donegal’s 15.9 M of total debt. [Don’t forget I’m including PPE, inventories, net receivables, etc. in this valuation also]. That’s worth 37.9 M – which equates (assuming a 12.5% tax rate) to a fairly reasonable 11.4 P/E. 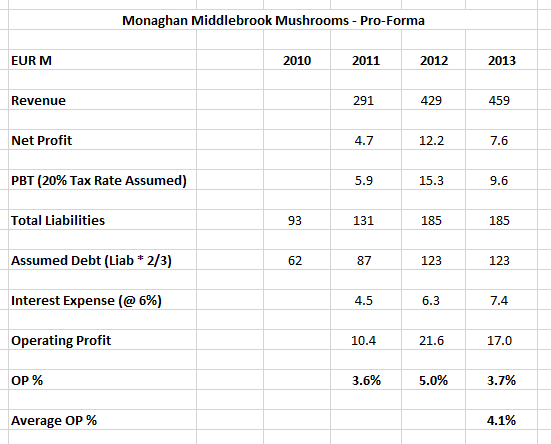 Monaghan Middlebrook Mushrooms (MMM): Last, but certainly not least, Donegal has a 35% stake in MMM. Rather oddly, the 5% option granted to MMM’s main shareholder & senior execs. still appears as a balance sheet liability, so the option expiry date must have been extended. We’ll gross up MMM’s figures from Donegal’s 35% share, but then assess fair value based on a 30% holding. Totting everything up – based on 10.1 M net shares outstanding – our Base Case NAV is EUR 95.6 M. Which equates to a EUR 9.46 NAV per share, for an Upside Potential of 58%. I believe management will ultimately concede & sell this division – one way, or the other! By which I mean: Management can mask/endure losses only for so long, a sale may end up being the least painful option. On the other hand, if the P&L turns profitable, I suspect it will be marginal at best – and potential acquirer interest & pricing will become far more tempting. I’ll assume a Sale – 2.9 M.
Stevedoring: Sale – 1.2 M.
Other Investments: Retain One 51 holding – 2.4 M. Sale of other investments – 0.3 M.
– An Grianan: Sale of 50% of farmland (940 acres) – 9.6 M. Retain remaining 50% of farmland, plus lake – 10.2 M.
– Ballyraine: Retain – assume valuation converges towards a long-term 7.8% yield, implying a 3.75 M value. – Agri-Stores/Oatfield/Bridgend: Sale – 2.4 M.
– Deferred Tax Liability: Settle – 1.8 M crystallized liability. Retain – remaining 2.0 M deferred liability. Associate Loans/Investments: Retain Leapgrange stake – 0.1 M.
– Animal Feed: Retain – despite being labelled non-core, and after 4 years of excellent sales & margins, there’s still zero sign management will ever sell. Clearly, they like the cash generative nature of the business, and it seems like a bad weather hedge for the produce division. However, if seed potato acquisition(s) are identified, I suspect the required funding will be the only likely impetus for an animal feed sale. Meanwhile, I’ll assume the OP margin remains around 4.2%. – Seed Potato: Retain – let’s assume the business reverts to the 10.1% average OP margin we saw in 2009-11. Which equates (assuming a 12.5% tax rate) to a fairly reasonable 11.8 P/E. Monaghan Middlebrook Mushrooms: Last year, I argued MMM’s high growth (& acquisition) strategy masks the underlying earning power of the business. Run as a more mature/cash generative company, I’d expect significantly higher margins to be squeezed from the business. By comparison, its closest UK peer – Produce Investments (PIL:LN) (which grows & sells potatoes) – tends to average a 4.4% OP margin. Considering the specifics of the mushroom business, plus the consolidation we’ve seen to date, I believe MMM has inherently superior margin potential vs. PIL. In fact, the handful of global peers would suggest 10% margins are possible. 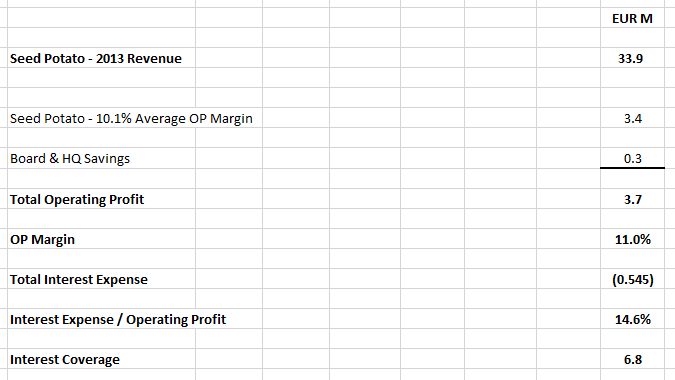 Let’s split the difference between such a peak margin & MMM’s recent 4.1% average OP margin, i.e. 7.0% – such a margin expansion, over the next 5 years, would deserve a 0.65 Price/Sales multiple. [Disagree? Well, if margin expansion is falling short, don’t forget I’ve 5 years to make it up – so hopefully increasing revenues & greater economies of scale bail me out]. More generally, it’s worth reminding readers no revenue growth, or accumulated profits/cash flows, are accounted for in this scenario – which adds a very nice cushion, particularly when there’s a 5 year investment horizon. Totting everything up, based on 10.1 M net shares outstanding, our 5 Years Out NAV is EUR 144.1 M. Add in 5 years of dividends & that equates to a EUR 15.06 NAV per share, for an Upside Potential of 151%. Our final scenario incorporates additional shareholder-value measures which management may perhaps be reluctant or unwilling to implement. Broadly speaking, it envisages accelerating & increasing the scale of Donegal’s disposal programme, and using all proceeds to aggressively repurchase shares (at a discount to intrinsic value) via tenders/buybacks. Of course, there’s no good reason for management to avoid such a compelling value proposition as share repurchase. Well, I could trot out some oft-cited excuses…but why bother?! Anyway, let’s maintain our faith in management here – after all, their sale of Donegal’s dairy & agri-stores business back in 2011 was an excellent decision for shareholders, and an astonishing break with the past. And since then, they’ve embarked upon the dismemberment of An Grianan. Now, the disposal process needs to be broadened & accelerated, with the resulting cash allocated to aggressive & opportunistic share repurchases (not debt pay-down, or a reduction in payables). The CEO & board are shareholders just like us, owning 5.1% of the company – they can run the numbers, just like me. Why on earth would they turn down this kind of additional upside on their shareholdings?! And if they did, shareholders obviously need to speak up & insist on a change of strategy. [It’s encouraging to see Argos Investment Managers build a meaningful 6.7% stake this year – this is Donegal’s first new institutional investor for a number of years]. Otherwise, we risk a corporate or financial acquirer swooping in & harvesting these gains for itself. [I’m disappointed to note only Ian Ireland, the CEO, has been awarded options – and it’s a mere 180 K. If shareholders are smart, they’d support broader & far more generous option rewards for management & the board – as long as they’re premised on a strike price fixed substantially in excess of the current share price. This would offer management a compelling incentive to use all available measures to engineer a (medium-term) step-change in the share price. Restricted stock awards are also a good idea – ideally, we want to see a much higher ratio of stock ownership vs. compensation. Again, this would significantly improve management & shareholder alignment]. Speciality Dairy: Sale – 2.4 M.
Receivables: Receivables improved to 29.8 M as of end-2013, but this still represents 4.1 months of revenue! [And management flagged a positive early harvest impact, so unfortunately we may see a reversal in 2014]. This ties up capital, and longer trade terms arguably increases the risk of non-payment. A (2 year) company-wide programme to introduce & then enforce average 3 month terms is the obvious remedy. This would release 8.1 M of surplus cash, and terms should still be generous enough not to impact customer relationships in any significant way. Other Investments: Retain One 51 holding 2.4 M. Sale of other investments – 0.3 M.
– An Grianan: Sale of 100% of farmland, plus lake – 19.8 M. It would be useful to employ a dual-track sales strategy (at least initially): To sell An Grianan as a single estate deal (probably to an overseas buyer), or to sell it piecemeal. – Deferred Tax Liability: Settle – 3.2 M crystallized liability. Retain – remaining 0.5 M deferred liability. – Animal Feed: Sale – as soon as possible. The division’s estimated OP margin of 4.2% deserves a 0.375 Price/Sales multiple – a 15.7 M value. We’re now looking at a business earning an 11.0% OP margin – which deserves another bump, to a 1.0 Price/Sales multiple. Debt isn’t an issue, with interest expense coming out at less than 15% of operating profit. That’s worth 33.9 M – which equates (assuming a 12.5% tax rate) to a still reasonable 12.2 P/E. Monaghan Middlebrook Mushrooms: Retain – 76.9 M.
Share Repurchases: Let’s assume the DCP share price increases by just over 40% in the next year & continues at half that growth rate (just over 20% pa) for the following 4 years. All net disposal proceeds will be ploughed into share repurchases, on an opportunistic tender/buyback basis. Again, it’s worth reminding readers no revenue growth, or accumulated profits/cash flows, are accounted for in this scenario – which offers a very nice cushion, particularly when there’s a 5 year investment horizon. [Another reminder: This scenario certainly isn’t about dismembering Donegal either – the core seed potato business will still have all the available resources it may require for continued healthy growth & acquisitions]. Totting everything up, based on a mere 4.6 M shares left outstanding, our 5 Years Out (& Additional Value Enhancement) NAV is EUR 116.5 M – add in 5 years of dividends & that equates to an astonishing EUR 26.08 NAV per share, for an Upside Potential of 335%. Now, these 5 Year scenarios obviously demand plenty of hands-on execution from management, plus no unexpected disasters. Shareholders are also very dependent on management acting like owner-operators, rather than agents. [Why not send your favourite director a copy of ‘The Outsiders’. The CEO & board can write the same kind of story with Donegal…] Rather than seizing on Scenario C, simply because it offers the highest NAV per share potential, we may need to consider a compromise. Perhaps an average of Scenarios B & C is now appropriate? 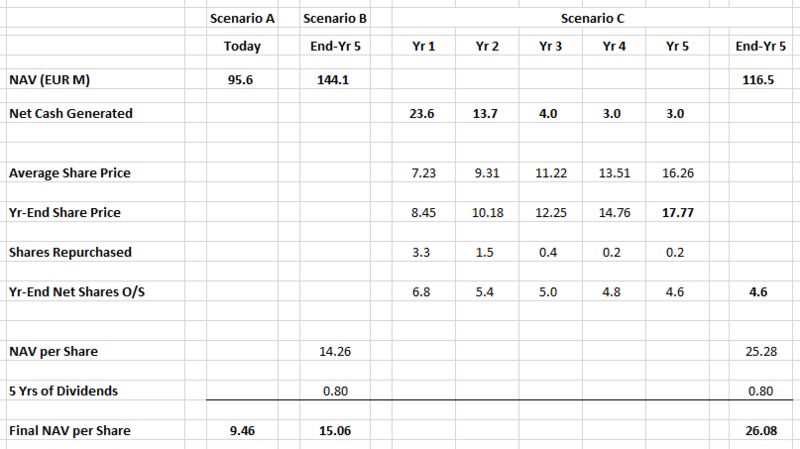 But Scenario B’s uplift in value (vs. Scenario A) is almost entirely premised on a substantial revaluation of Donegal’s MMM stake. Which could prove somewhat problematic…because Donegal’s now engaged in a legal spat with MMM & Ronnie Wilson. You can read about it here. The laundry list of complaints is a familiar legal tactic – I suspect what we really have here is a fundamental falling out over strategy. As long as Ronnie’s in charge at MMM, one can expect him to stick with his very successful revenue growth & acquisitions strategy, while Donegal appears to lean more towards extracting higher margins & returns from the company. Arguably, both are valid strategies – in fact my final MMM valuation is premised on transitioning from one to the other. But MMM revenue will likely surpass a half billion euros within the next year, who’s to say Ronnie Wilson won’t deliver even greater value (than I’ve projected over the next 5 years)? Why bet against a winning track record…and a majority shareholder? What concerns me though is these shareholder disputes often get resolved with a transaction – one party buys out the other, or an acquirer barges in. If Donegal ends up (willingly, or unwillingly) cashing out, debate over revenue growth vs. margins becomes moot – the substantial value creation I see from MMM in the next 5 years simply evaporates. Sure, ploughing the proceeds back into share repurchases would be nice…but Donegal can already do that, without ever touching MMM! Shareholders should demand confirmation management’s seeking to patch up any differences, not just siccing the lawyers, and focusing their attention instead on selling An Grianan & the animal feed business as soon as possible. That being done, upgrading my price target (to a EUR 20.57 Fair Value per share, based on averaging Scenarios B & C) would certainly become a real possibility. Meanwhile, I’m obviously very comfortable with my Base Case NAV of EUR 9.46. 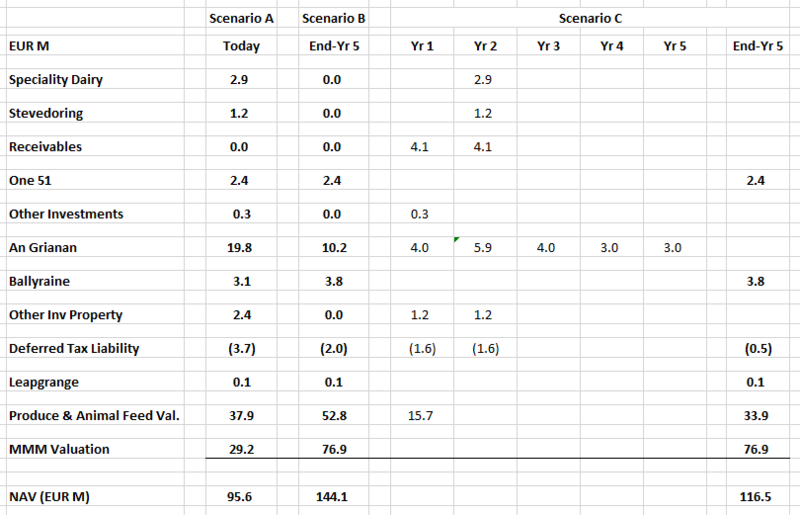 So let’s opt for this compromise – an average of Scenarios A & C, which gives us a EUR 17.77 Fair Value per share. 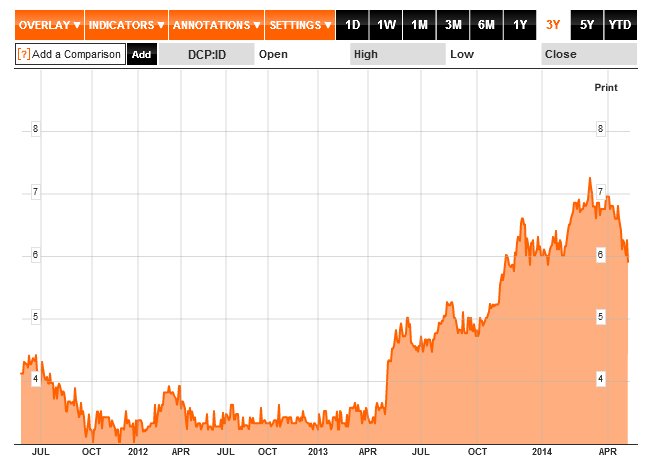 [And equals my projected end-year 5 DCP share price]. This offers an Upside Potential of 196%. 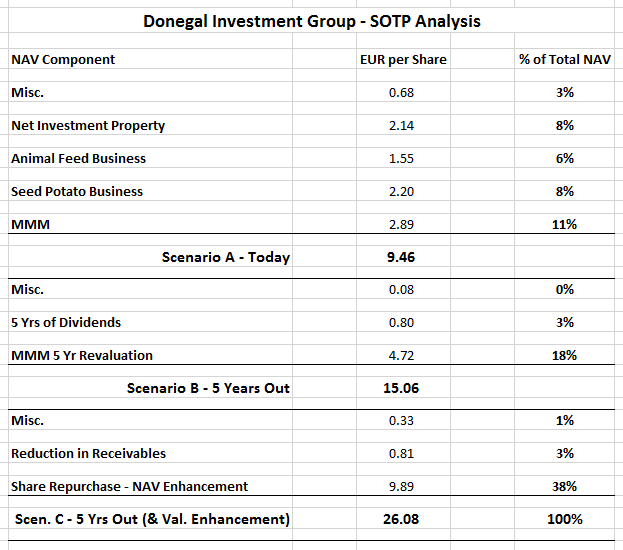 I currently have an 8.2% portfolio allocation to Donegal Investment Group – I haven’t sold a single share. – Repurchasing as many shares as possible (with the proceeds)! The CEO seems to agree, he bought a few shares below € 6 a few days ago. Great write-up! Thanks. Yup, his trade date’s reported as May 15th, so that places it later that day after this post was published – make of that what you will…but as you say, we’re all definitely on the same page!